Early in the morning of Monday, April 13, I walked across the McCormick Center in Chicago. I headed toward the exhibition floor. I had an exhibitor’s pass, so even at that early hour I was allowed into the mammoth room. I passed glorious booth after glorious booth. Many venues were filled with plush carpets, large flat screens, food kiosks and even fine art. I walked through isle after isle until I arrived at the 5300’s. Then I turned, dragging my art supply case behind me. I walked up the isle toward the HIStalk booth. The HIStalk booth was modest in the extreme. The booth itself was a 12-foot by 12-foot space. The carpet thin, the back drapes were a simple white. Two standing panels explained that HIStalk was the site for up-to-date news in HIT and the place to build your brand. In the center was a foam core cut out of the Tim’s avatar from HIStalk. A table with one chair graced the entrance of the booth. The booth may have seemed austere, but I assure you HIStalk spares no expense where it really matters. I attended my fourth HIMSS conference April 12-15, 2015 because of HIStalk. This conference is one of the largest in the field of healthcare. Over four short years, I have seen it begin to transform. I used to be one of the few self-described patient attendees. Now there are many of us. I almost did not attend this year due to costs, but HIStalk came to the rescue. In the spring of 2014, I did an interview with Tim from Histalk. In that interview I bemoaned the lack of patient representation at HIMSS and explained that few patients could afford to attend the event. Tim offered to help create a scholarship for patients. This year I reached out to Tim so we could make that scholarship a reality. Of the many patients who applied, five were chosen to receive scholarships. HIStalk also offered me a scholarship to cover most of my air travel and most of my hotel costs. I was still homeless at HIMSS on Tuesday night, but Kourtney Govro from Sphere 3 Consulting came to my rescue (as she did in 2014) with a last minute room. When I arrived in that modest booth on April 13, 2015, I began to set up my easel and paint jackets for The Walking Gallery. Every few minutes a vender would come by and thank HIStalk profusely for what it does. I would explain that I was working with HIStalk on their scholarship campaign and would give the HIStalk team the messages. I heard the phrase “We are your biggest fans!” at least a hundred times. Almost every vender that came by left swag and small gifts for the HIStalk team to give away. 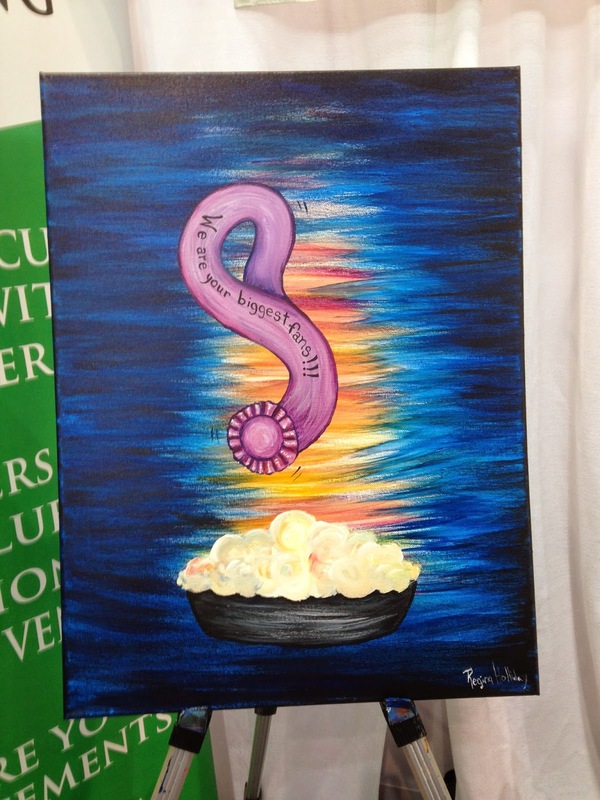 Lori and Jenn from Histalk arrived around 11 and received many accolades and I continued to paint. Soon the patient scholars began arriving. There was Carly Medosch, who speaks on behalf of so many patients with chronic illness. Tami Rich who advocates for both her aging parents and her son with a heart condition. Melanie Peron who after loosing her life partner, created The Butterfly Effect: a social enterprise to improve care transitions using art, story telling, and technology. Amanda Greene who advocates on behalf of the Lupus community. Kim Witczak was the final scholarship recipient, but sadly could not attend due a time conflict at home. As each fellow patient arrived we embraced in joy. Then each patient began the exhausting process of going to vender booth after vender booth and talking about technology from the patient perspective. I stayed in the HIStalk booth and painted. I listened to the attendees praise the work of HIStalk as they eagerly spoke about the HIStalkapalooza party on that Monday night. Of all the parties that happen at HIMSS, HIStalkapalooza is the golden ticket event. Each year it has grown and grown. This year it was hosted in the House of Blues. The event was standing room only. I and the other patients attended the festivities and Melanie even wore a French couture ball gown! I am not one for crowds, so I stood in a quiet corner by the bar and listened to Jonathan Bush, co-founder of Athena Health and Walking Gallery member, get a pie in the face. Everyone in the room was so jolly. It was a lovely evening and I thank HIStalk for inviting us. On Tuesday, I painted Carly Medoch’s jacket “My Medicine.” In that painting pills that treat pain through chemicals morph into the bunnies that treat pain through cuddles within the swirling cacophony of Carly’s life. 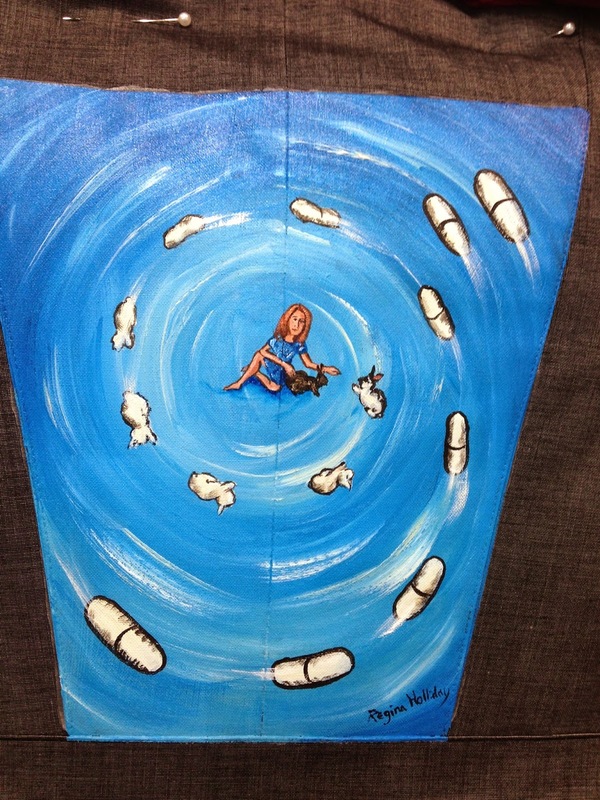 I finished it in time for her to gather in the HIStalk with the other members of the Walking Gallery at HIMSS. I’m not sure who is saying that phrase. Is it the hundreds of attendees that visited this nondescript booth in the hinterlands of the trade-show floor? Or is it the staff of HIStalk who loves their readers and knows money invested in a fancy booth is money that is not spent on people, patients and parties where we all embrace each other.